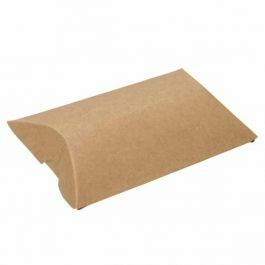 Our KPB78 pillow boxes measure 5" x 1 1/4" x 7" and have a usable space of 5 3/4" ( middle space). 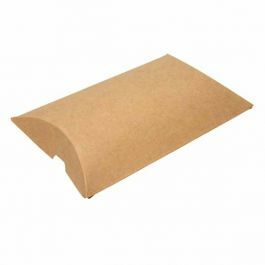 These boxes made from 230 gsm Kraft board offer a eco friendly option for the retail environment. Great for notebooks, journals, cosmetics, skin care products and more. Stickers are included, to purchase additional stickers click here to see our full list of sticker options. 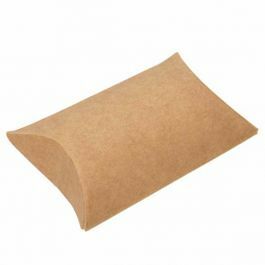 Our KPB78 Kraft Pillow Boxes offer a unique and eco-friendly option for packaging items with natural ingredients, such as cosmetics and skin care products. It measures 5" x 1 1/4" x 7" and has usable space of 5 3/4" (middle length). This larger paper box also works well for journals, favors, and small electronics. Fold tabs along seams to close. Boxes will keep closed without adhesive. Clear round stickers are included with this box to provide a secure and tamper resistant seal for your product. Customize with labels or a stamp of your company logo. Custom printing also available.